Richard is an artist, author and illustrator with more than 30 years professional experience. He writes, illustrates and publishes books for children, designs Australiana Koala Christmas cards that have travelled to every corner of the globe, and teaches kids how to draw cartoons in primary schools and libraries. Check out the books, stationery and prints at our online store. While you're here, please have a look at some of Richard's art at our online gallery. "If you want to learn to draw, be sure to download this app!" "Super clean and easy to use. Too cool!" Check out the step by step cartoons you can draw from the website. It's great fun, and really simple. And you get a fantastic result! You can shop with confidence, knowing your payment details are protected by eWay, one of Australia's top online payment gateways. 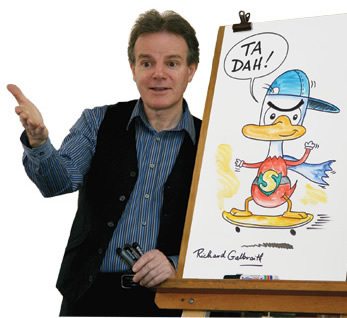 Richard visits primary schools and libraries throughout Victoria and shares his tips and ideas to help kids bring their cartoons to life. 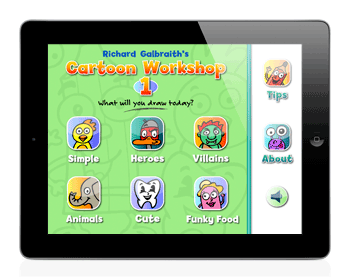 Richard's cartoon workshops are a regular feature in many schools, and are perfect for every level from Prep to Grade Six. "It's fun and exciting and you never know what's going to happen next!" Help your students discover their creative talents! "Thank you for a fantastic week to kick off the year. The students have absolutely loved it!"